Antipsychotic medications are used for many purposes. Many, if not all of them, have anti-manic as well as anti-psychotic effects. Many of the medications are also helpful in treating depression (either as an add on medication to an antidepressant, or on their own, for people with bipolar depression). They can also be helpful in treating severe forms of anxiety and insomnia. In other words, the term “antipsychotic” is somewhat inaccurate, although all of the medications in this category to also have antipsychotic effects. Broadly, antipsychotic medications can be categorized as “typical” or “atypical” antipsychotics (a similar distinction is made between “first generation” and “second generation” antipsychotics). However, this distinction is not quite as useful as it would seem. Some medications that were discovered long ago, and are thus “first generation” antipsychotic medications, and would usually be thought of as “typical” antipsychotics, have properties that are more similar to other “atypical” medications. Typical versus atypical really refers to whether the medication has effects other than blocking dopamine 2 receptors (which is generally thought to be the reason most of these medications are antipsychotic) which reduce the severity of extrapyramidal side effects (EPS symptoms of muscle stiffness, muscle spasms, etcetera). 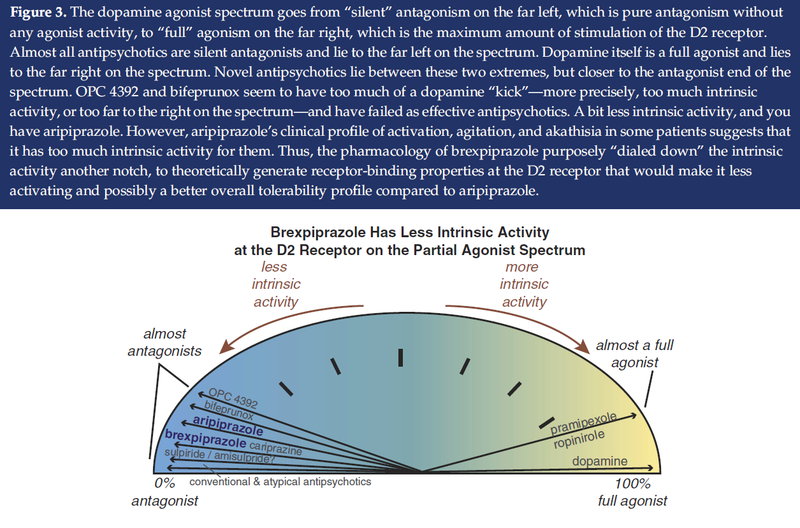 A “typical” antipsychotic is generally one that is a relatively pure dopamine 2 receptor blocker, and, as a result, at doses that are effective for treating psychosis, a typical antipsychotic will have a tendency to cause EPS. Fluphenazine (Prolixin) and haloperidol (Haldol) are the prototypic typical antipsychotics. These agents are also called “high potency” antipsychotics. An atypical antipsychotic is one that has other effects (most commonly a tendency to block serotonin 2 receptors) in addition to the dopamine blocking effects which reduce the tendency to cause EPS. Because of the confusion embedded in the distinction between typical and atypical agents, in this article I propose to classify the medications based on similarities in pharmacology. 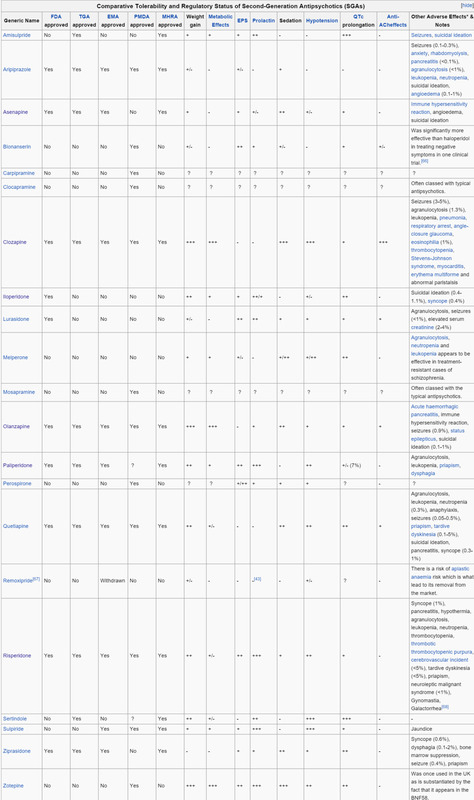 The wikipedia article on antipsychotics classifies medications by structure (butyrophenones, diphenybutylpiperidines, phenothiazines, thioxanthines, others, etcetera) but this is not as useful clinically. 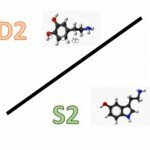 High potency dopamine 2 antipsychotics are most useful when the goal is control of symptoms of psychosis without the risk of anti-cholinergic, or anti-histaminergic side effects. They are the mainstay of treatment of psychosis in the acute hospital setting (a medically ill patient who has psychotic symptoms). In these settings they are often combined with another agent to reduce the incidence of extrapyramidal side effects. They are almost all available as both oral (pill form) medications and as injectable medications. They tend to have fewer cardiac adverse effects (prolongation of the QTc interval and consequent arrhythmias), which is also important in an acute care setting. This group of medications is “atypical” in the sense that these medicines do not usually have the same amount of EPS side effects, at comparable doses, as the high potency dopamine 2 antipsychotics, however it does not have the anticholinergic, antihistaminergic and other effects of other antipsychotics. Perhaps because these medications lack those other effects, they tend to be somewhat less “atypical” and tend to have somewhat more EPS compared with other atypical agents. As with the high potency dopamine 2 antipsychotics, they are generally safe in an acute psychiatric or medical setting, or in patients with other risk factors for adverse effects other than EPS – patients who are older, or have other medical conditions that might lead to a greater risk of confusion or delirium if given an agent with anticholinergic effects. This is a group of medications that combines dopamine 2 blockade with mild anticholinergic effects which somewhat reduce the likelihood of EPS. 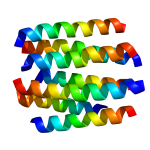 Molindone is somewhat controversial. Some people feel that it may be better thought of as an “atypical” antipsychotic as the risk of EPS in those taking molindone seems less than one would expect given its dopamine 2 effects. As a group, these medications are relatively rarely prescribed now. This is a heterogenous group of antipsychotics that have broad effects on multiple receptors, including dopamine 2 (of course) and often including serotonin 2 receptors. The list below includes both “typical” and “atypical” antipsychotics. What tends to unite this group of antipsychotics is that many of them have evidence for greater effectiveness in at least some patients with psychosis, and, perhaps, other conditions as well. The prototype of this broader effectiveness, is clozapine, which remains the single antipsychotic with the strongest data supporting effectiveness. It is also a medication that is underused in many settings where people with serious mental illness are treated. This is because of its adverse effects which are almost enough to offset the greater effectiveness of the medicine, and limit it to use in people who fail to respond to other antipsychotics, including some relatively unique adverse effects (most dramatically, suppression of white blood cell formation). Medications in this category tend to be more sedating (antihistamine effects) and to cause more dry mouth, blurred vision and to increase the risk of confusion, especially in the elderly (anticholinergic effects). Several medications in this category have been discontinued because they have been associated with a greater incidence of severe adverse effects (including death) when used in an acute setting (notably thioridazine). In addition to antihistamine and anticholinergic side effects, most of the medications in this group are associated with greater risk of cardiac toxicity, which may explain the association with sudden death in acute settings. Because of their broad effects, these medications also have more potential negative drug interactions. For example, olanzapine carries a warning against combining the injectable form of the medicine with the use of benzodiazepines. This is a place for listing medications that appear to have significant antidepressant effects when used alone in the treatment of bipolar depression. Why these medications have this effect is not known. There are many theories (for example, effects on serotonin 7 receptors, effects of metabolites on reuptake proteins, etcetera) but it is not possible to find a clear and consistent pharmacologic explanation as I write this. The selection of these medications is largely based on data from large, well designed, clinical trials showing significant effect sizes (a clinically significant response, not just a statistically significant finding) on bipolar depression when used alone (not combined with an antidepressant). Many atypical antipsychotics seem to be helpful as adjuncts to antidepressants in the treatment of major depression, and this may be true of almost all atypical antipsychotics, so medications are not added to this list just because they have this effect. However, aripiprazole is included in this list because it has some of the strongest data for effectiveness as an adjunctive agent in the treatment of unipolar depression, although it did not show effectiveness as a single agent in the treatment of bipolar depression. Aripiprazole (Abilify) – Only as an adjunctive medication in the treatment of unipolar depression. Dopamine partial agonists are medications which are “atypical” not because they combine dopamine 2 and serotonin 2 effects, but because they have both antagonist (blocking) effects on dopamine receptors and agonist (stimulating) effects. In an ideal world, this would allow a medication to fill in for areas of the brain with too little dopamine activity (for example, in the areas that are associated with pleasure and reward, the meso-limbic pathways) and block activity in those areas with too much, where dopamine activity causes psychosis. However, there is not a clear distinction between these two areas. At best, they overlap each other, at worst they may be the exact same set of neurons. Nevertheless, these medications do appear to have some unique effects. At lower doses they may be more effective as “antidepressants” and at higher doses they may have more antimanic and antipsychotic effects. As a group, they have fewer anticholinergic and antihistaminergic effects (dry mouth, sedation) and are associated with somewhat more of a tendency to cause nausea. In addition, these medications are only moderately effective (NNT of around 8 or 9) in the treatment of acute psychotic schizophrenia. This makes sense if the key to treating acute psychosis is thought to be blockade of the dopamine 2 receptor. Even at high doses these medications have less of a dopamine 2 blockade effect compared with other antipsychotics. Aripiprazole (Abilify) – Aripiprazole is also available as a short-acting intramuscular injection for the management of agitation associated with schizophrenia or bipolar mania. A long-acting injectable formulation of aripiprazole for the treatment of schizophrenia is also marketed, using a different product label. A recent study found that aripiprazole augmentation was especially useful for older adults with depression. Brexpiprazole (Rexulti) – Compared with aripiprazole, brexpiprazole has lower intrinsic activity at the dopamine D2 receptor and has an approximately 10-fold higher affinity for serotonin 5-HT1A and 5-HT2A receptors, potentially enhancing tolerability. Although all three agents are dosed once daily, the starting dose for brexpiprazole (1 mg/day) is lower than the recommended dose range of 2–4 mg/day for schizophrenia or the recommended dose of 2 mg/day for major depressive disorder. Thus, brexpiprazole will require titration. For weight gain, the NNH was similar for brexpiprazole and aripiprazole in schizophrenia studies, but brexpiprazole had about twice the NNH for depression studies, meaning that brexpiprazole caused significant weight gain about half as often as aripiprazole did. For sedation, the NNH showed that brexpiprazole caused more sedation than aripiprazole in schizophrenia but less sedation than aripiprazole in major depression.Citrome’s analysis of efficacy using the number needed to treat (NNT) showed that this was similar for both brexpiprazole and aripiprazole. Cariprazine (Vraylar) – When cariprazine was compared with aripiprazole in functional assays for dopamine D2 and D3 receptors, similar D2 and higher D3 antagonist-partial agonist affinity and a 3- to 10-fold greater D3 vs. D2 selectivity was observed for cariprazine.Whether targeting the dopamine D3 receptor over the dopamine D2 receptor is clinically advantageous remains unknown but theoretically dopamine D3 preferring agents may exert pro-cognitive effects. A recent study finding that cariprazine was more effective at treating negative symptoms of schizophrenia than risperidone suggests that there may be some specific effects on functioning with cariprazine. For the treatment of bipolar mania, cariprazine will need to be titrated from the starting dose of 1.5 mg/day to the recommended target dose range of 3–6 mg/day; this can be done on Day 2. Cariprazine has been tested in clinical trials at higher doses; however, doses that exceed 6 mg/day did not confer significant additional benefit.Of note, an important metabolite of cariprazine, didesmethyl cariprazine, has a half-life of 1–3 weeks, thus following discontinuation of cariprazine the decline in plasma concentrations of active drug and metabolites will be slow. Since the effort to categorize these medications is a bit of a leap of the imagination, one could argue that all of the medications listed belong here, they are all unique. My list of “other” agents is for atypical antipsychotics that don’t readily fall into any category. Asenapine (Saphris) – Asenapine is an atypical antipsychotic that has all of the effects of a low potency medication except for its complete lack of anticholinergic effects. It is poorly absorbed from the GI system and must therefore be absorbed from the tongue and oral mucosa (you hold the liquid in your mouth). For this reason it has not been widely used. This is a review article about its use in bipolar disorder. Molindone (Moban) – Listed here because it is a “first generation” antipsychotic that many people feel might have been the first “atypical” antipsychotic. Its manufacture was discontinued a few years back in the United States. This section is a place for storing information about how these medications affect neurotransmitters, disease states, and other outcomes. A very useful way of comparing medications is looking at the number needed to treat (NNT) and number needed to harm (NNH) across medications. NNT and NNH are a way of measuring not just whether a finding is statistically significant but also whether the result is clinically meaningful. A statistically significant finding can be the result of a study that enrolled a very large sample of patients. Imagine a study of a medication for high blood pressure that enrolled 2000 patients in the active medication group and another 2000 patients in a placebo group which found that this new medication had a statistically significant effect – it reduced blood pressure in the active group in a way that was very unlikely to be due to chance). This result may be enough to get the medication approved, but it might also be the case that the effect is clinically insignificant (in that study, for example, the finding of a consistent 2 mm Hg of reduction in blood pressure would be clinically insignificant – unlikely to confer any noticeable benefit). As a rough rule of thumb a NNT of between 0 and 5 is a very significant effect. A NNT of between 5 and 10 is a moderately significant effect. A NNT of more than 10 is a slightly significant effect. In terms of propensity for weight gain, there are two considerations. The likelihood of any weight gain (bearing in mind the fact that, on average, Americans are gaining about one pound per year, and thus, even placebo is going to be associated with weight gain over time) and the likelihood of clinically significant weight gain (usually defined as more than 7% of pretreatment weight). The greatest weight gain is associated with two medications which have not only the highest likelihood of any weight gain as well as the highest likelihood of significant weight gain. Unfortunately, these medications also have some unique benefits for some patients. The good news is that, even with these medications, most patients do not have significant weight gain. People who are going to gain a significant amount of weight typically report a sudden (within a day or two) fairly dramatic increase in carbohydrate craving (raiding the refrigerator at night for ice cream or other high carbohydrate foods). Thus, if there is a good reason to try one of these medications, it is reasonable to do so and closely monitor for weight gain. If there is no significant change in appetite or weight in the first two weeks of treatment the risks of significant weight gain over time are much reduced. Most of the rest of the agents fall into a moderate risk category. I put aripiprazole in this category although the clinical studies (short term studies) found little evidence of weight gain. With this agent, and perhaps other partial agonists, the effect is a gradual increase that is not well demonstrated in short term studies but is nevertheless greater than the general weight gain associated with living in this country. These medications seem to have consistently lower risk of weight gain. In some clinical trials there is net weight loss over time. This likely reflects the fact that many people in these trials are being switched from other agents. Quetiapine (Seroquel) – Despite what the manufacturer said when they released the extended release form, the highest risk is with XR. Typically people report that they sleep an hour to an hour and a half more when taking this medication. The effect may be less if the medication is taken earlier than at bed time (peak absorption is slow and takes about 2 hours, so taking half at dinner time and half an hour before bedtime may be the ideal way of reducing morning sedation). Olanzapine (Zyprexa) – Less than quetiapine but still significant. Absorption is even slower than with quetiapine so taking all of this medication after dinner may be the best way of avoiding excessive daytime sedation. The clear winner in this category is quetiapine which in many trials had lower rates of EPS than placebo. Results with other agents are more variable. Some studies find very low rates, other studies higher rates, in a way that is hard to make sense of, but generally clozapine, olanzapine and asenapine appear to be quite low.